Heb je meerdere printers, dan stelt dat eigenwijze Windows 10 elke keer je laatst gebruikte printer als standaard in. Stel dan de juiste standaard printer in. To understand what’s happening, consider Printer & Scanners settings, which you can find in available in Settings, Devices. 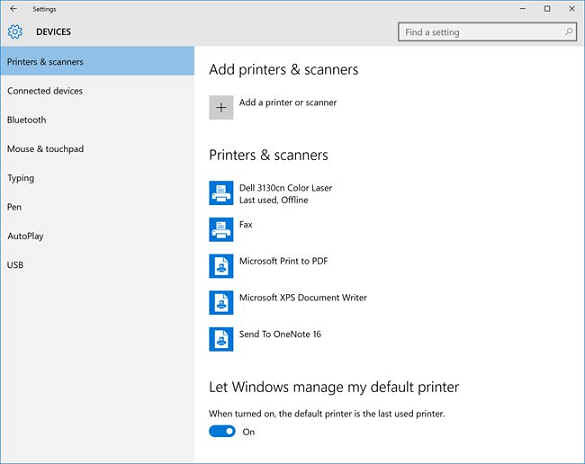 Here, you can see two relevant items: The top printer, Dell 3130cn Color Laser, is marked as “last used.” And the option “Let Windows manage my default printer” is set to On. “Let Windows manage my default printer” is new to Windows 10 version 1511. When left on its default setting of On, Windows 10 will always configure the default printer to be the most recently-used printer. I’ve found this setting to be undesirable. In my case, the Dell printer is indeed the printer I’d like to use as my default. But I sometimes print to PDF as well—a feature that debuted in the initial release of Windows 10—and when I do so, the default now changes from my Dell printer to Microsoft Print to PDF. I happen to find that annoying, and disable this option. If you don’t like this behavior either, just change this option to Off. Bonus tip: Printers & Scanners settings provides only basic printer controls: You can add new printers here, but there’s little in the way of printer configuration. But the legacy Devices and Printers control panel that’s been available for the past several Windows versions is still in Windows 10, and it provides much more control over printers. You can access this by selecting the link “Devices and printers” in Devices, Settings, or via Start Search.